There is an awesome grassroots initiative going on right now that every birder needs to be a part of . It is called the Pledge 2 Fledge (P2F). The Global Birding Initiative is sponsoring the P2F from August 24-26. The goal is for all birders to introduce new people to birding. If we can all help to get more people interested in birding, we will have that many more people that are concerned about protecting birds and their habitats. It couldn't be easier to participate in the event! Take the pledge and then introduce someone new to birding. Be sure to share your story with as many people as possible (Facebook, Twitter, etc.) so we can fledge even more birders. 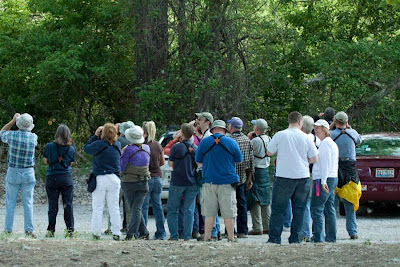 Hordes of birders looking for a Kirtland's Warbler at the the Midwest Birding Symposium in 2009.